At approximately 0300 on 1/29/2019, two unidentified White or Hispanic male individuals broke into Cherry Blow Dry Bar located at 3975 State Highway 6 South and stole an unidentified amount of merchandise. If you have any information regarding the identity of the two individuals shown below, please contact College Station Police Department or Brazos County Crime Stoppers at 1-979-775-TIPS (8477). 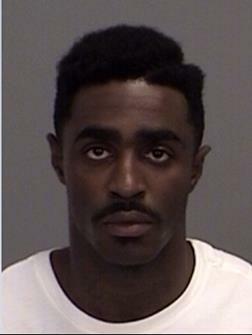 College Station PD is looking for Hakeem Jamal Rollins, age 23. He is wanted in association with the October 11, 2018 robbery of a man at the 800 block of Harvey Rd near the Woodstone Shopping Center. To see information about the robbery click here. Rollins is a black male, 5’8”, 145 lbs and has two warrants for his arrest. If you have any information about Rollins, please contact Brazos County Crimes Stoppers at 979-845-TIPS (8477) or through the web (brazos.crimestoppersweb.com) or mobile app. If your tip leads to his arrest you may receive a $350 CASH reward. On October 30th, 2016, the Rohr Chabad Jewish Center located in the 200 block of Live Oak Street in College Station was the victim of a theft. At approximately 3:15 am, security camera footage shows a suspect approaching the sign located in front of the building and kicking it. The suspect then backs up and can be seen running towards the sign and kicking it again. At this time a car can be seen passing by as the suspect backs up and kicks the sign once more. After a brief lapse in footage, the sign is missing. 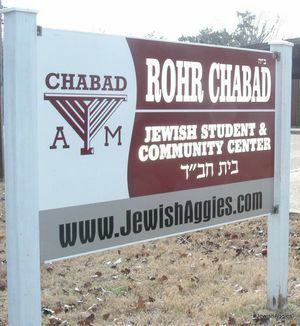 The sign is white and maroon and has the inscription of Rohr Chabad Jewish Student & Community Center displayed on it. Brazos County Crime Stoppers is asking for anyone who may know the identity of the suspect involved or witnessed this incident to call Brazos County Crime Stoppers at 775-TIPS. You do not give your name when you call Crime Stoppers, you will be given a special coded number. The information you give will be shared with the appropriate law enforcement agency and if your information leads to an arrest or recovery in the case, you will be eligible for a cash reward. Help fight crime in your commun<?xml:namespace prefix = "v" ns = "urn:schemas-microsoft-com:vml" />ity by calling Brazos County Crime Stoppers today. Security camera footage shows what appears to be a small, light colored, late model sedan with a third brake lamp and shiny wheel rims make four passes in front of the building. On the last pass, the vehicle slowed and you can see a series of muzzle flashes coming from the open front passenger window. Once the shots were fired, the vehicle sped away in an easterly direction. This case has been classified as Deadly Conduct. The risk of harm was high due to the fact that it occurred in the densely populated area of Northgate and the potential that someone could have been in the building for early prayer services. Brazos County Crime Stoppers is asking for anyone who may know the identity of the suspects involved, the vehicle’s owner, or witnessed this incident to call Brazos County Crime Stoppers at 775-TIPS. You do not give your name when you call Crime Stoppers, you will be given a special coded number. The information you give will be shared with the appropriate law enforcement agency and if your information leads to an arrest or recovery in the case, you will be eligible for a cash reward of up to $1,000. Help fight crime in your commun<?xml:namespace prefix = "v" ns = "urn:schemas-microsoft-com:vml" />ity by calling Brazos County Crime Stoppers today. 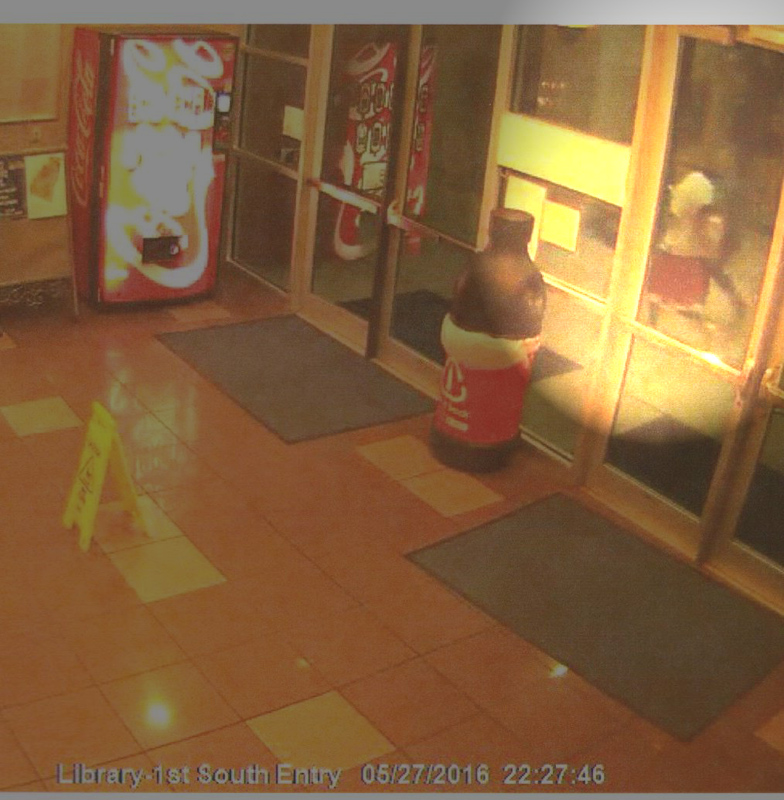 On Friday May 27th at 10:26pm, the Blinn College on Villa Maria Road in Bryan was the target of vandalism. A surveillance video shows two suspects walking towards the College Library building each were carrying a golf club. Minutes later a surveillance camera inside the building shows both of the suspects swinging their golf clubs and striking the windows. A total of 23 windows were broken resulting in over $5,000 worth of property damages. Officers with the Blinn College Police Department believe that the suspects are either White or Hispanic. The lead suspect is wearing a white shirt, red shorts with white trim around the legs and whit tennis shoes. The second suspect is wearing all dark clothing and has long hair and could either be a male or female. 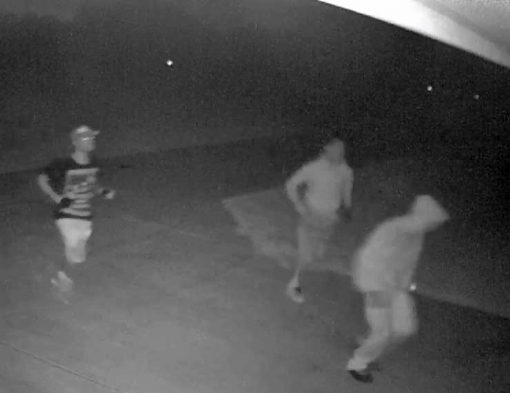 If your recognize the vandals shown, please call Brazos County Crime Stoppers at 775-TIPS. If your information leads to an arrest in this case, you will be eligible for a cash reward of up to $1,000. At approximately 3:58am on the morning of Sunday, November 15, 2015 a fire call was received for the White House Lounge on San Jacinto Street in Bryan. The first engine arrived to find a fully involved structure. After the fire was put out, Bryan Fire Marshal`s began their investigation and determined that the fire was set intentionally, the work of an arsonist. Fire Marshall`s also detected an odor similar to gasoline coming from the property next door, the Green Hornet Lounge. Further investigation revealed the back door had been forced open and a flammable liquid had been poured inside. Attempts had been made to light this liquid but were not successful. An accelerant canine from Texas State Fire Marshall`s Office was brought in. The dog made three hits in the White House Lounge and two hits in the Green Hornet Lounge, confirming the finding of the Fire Marshall. Brazos County Crime Stoppers is asking for anyone who may know the identity of the arsonist(s) in this case to call Brazos County Crime Stoppers at 775-TIPS or leave a web tip on this page. If your information leads to an arrest in this case, you will be eligible for a cash reward of up to $1000. Overnight on August 7th thieves committed 20 vehicle burglaries in the Steep Hollow area of eastern rural Brazos County. In each of the cases the thieves entered the vehicles as they were parked outside of the homes. Two of the homes had security cameras that recorded video showing the suspects. In the video the thieves are seen leaving their vehicle and approaching the target vehicles, then are seen entering a parked vehicle where they ransack it looking for items to steal. The suspects then exit the vehicle and move on to other vehicles parked nearby. Three thieves are seen in the videos and appear to be males, either Hispanic or Caucasian. One suspect with dark hair is wearing what appears to be a hoodie, shorts and sneakers. One of the other suspects is wearing a dark colored shirt with a reflective or shiny image on the front, shorts and a ball cap. In one video, the suspects are seen getting out of a light colored type vehicle. Brazos County Sheriff`s Investigators believe that the same suspects committed all of the burglaries. There were no signs of forced entry on any of the vehicles. All of the vehicles were ransacked, eleven owners reported that items were stolen from their vehicles. Four firearms were some of the reported stolen articles. Brazos County Crime Stoppers is asking for anyone who may know the identity of the suspects shown above to call Brazos County Crime Stoppers at 775-TIPS. A cash reward of up to $1000 is offered for information leading to an arrest or recovery in this case. It was discovered on December 17, 2013 that two drill bits were missing from the Patterson Rig 218 located in the 8600 block of Weedon Loop in Brazos County. The Rig Supervisor advised when he arrived on December 17th, he noticed an empty box sitting under the office trailer and thought that maybe the bit was in use on the rig. After an inventory check was completed, it was determined that two drill bits were missing. 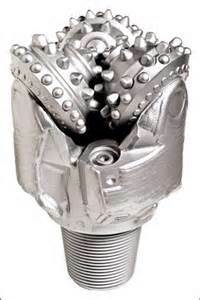 A delivery ticket dated 11/26/2013 shows a VM-1 12-1/4 (311.2MM) Drill Bit valued at $30,650 had been delivered on that date. Another delivery ticket dated 12/12/2013 shows a GX-09 8-1/2 (215.9MM) Drill Bit valued at $17,700 had been delivered on that date. The Rig Supervisor advised that the missing drill bits are extremely heavy and it would require a fork lift or several people to load and move them. On Monday, December 23rd employees of Bryan Freightliner, located at the intersection of FM 2818 and State Highway 6 North in Brazos County, arrived to work to discover that thieves had burglarized the shop building. Evidence indicates that the thieves gained entry into the fenced yard by cutting through the fence and driving to the shop where they forced their way in. Once inside, the thieves searched and ransacked through employee toolboxes and stole hand tools, power tools and a Miller electric welder. Sheriff`s Investigator report that ten different employees had tools stolen and that the loss estimate for those tools is over $150,000. At approximately 11:10PM on Saturday, July 17th two black males robbed a male victim while he was sitting outside the Evans Library on the Texas A&M Campus. One of the black males grabbed the victim`s head and pushed it down on the table while demanding money. The other suspect searched through the victim`s backpack and stole all the cash that he had stored in a pocket. Afterwards, both robbers fled the scene on foot running toward the construction area on the east side of the Evans Library. The suspects are described as black males, each approximately 5`10" with medium build, and wearing dark colored hoodies. Texas A&M University Detectives advise that no witnesses have come forward and are hoping that someone would know something about the robbery or could have heard someone bragging about committing the crime. It was just after 3:00AM on Saturday, December 17, 2011 when burglars forced their way into `The Great Texas Gun Company` located on Highway 21 East of Bryan in rural Brazos County. Evidence indicates that five (5) or more suspects were involved in the crime and that they drove up and used tools to force their way in to the building. Once the thieves gained access to the building they rushed in and stole the guns. Surveillance video shows the suspects as they quickly grabbed eighty (80) rifles and handguns and carried them out of the store through the hole in the wall, then left the area in a vehicle. Brazos County Sheriff`s Office Investigators advise that the thieves had planned and organized the theft. Since the December theft some of the stolen guns have been recovered in Corpus Christi and the Robstown area of Nueces County, Texas. Brazos County Crime Stoppers are asking for anyone who may know the identity of the thieves in this burglary or the location of the other stolen guns to call Brazos County Crime Stoppers at 775-TIPS. You do not give your name when you call Brazos County Crime Stoppers, you will be given a special coded number. The information you give will be shared with the appropriate law enforcement agency and if your information leads to an arrest or recovery in the case, you will be eligible for a cash reward of up to $1000. The Alcohol Tobacco and Firearms (ATF) are assisting the Brazos County Sheriff`s Office with the investigation and have offered an additional reward of up to $5000. ON SATURDAY, SEPTEMBER 17TH THE CONSTRUCTION SITE FOR THE ARMY RESERVE CENTER WAS THE TARGET OF THIEVES. SOMETIME AFTER WORK CEASED ON THE JOB SITE AT 2350 NORTH HARVEY MITCHELL PARKWAY IN BRYAN, THIEVES STARTED A FORKLIFT THAT WAS PARKED AT THE SITE AND USED IT TO RAM THROUGH A FENCED ENCLOSURE. ONCE INSIDE, THE THIEVES USES BOLT CUTTERS TO OPEN THREE STORAGE CONTAINERS, THEN USED THE FORKLIFT TO RIP THE DOOR OFF ANOTHER. THE THIEVES STOLE WELDING AND CUTTING EQUIPMENT, POWER TOOLS, HAND TOOLS AND COPPER FITTINGS FROM THESE CONTAINERS. THE FOUR WELDERS, PLASMA TORCH AND OTHER EQUIPMENT WERE HEAVY AND WOULD HAVE TAKEN A LARGE TRUCK OR TRAILER TO HAUL OFF. THE TOTAL VALUE OF THE LOSS WAS ESTIMATED TO BE OVER $73,000. BRYAN POLICE DETECTIVES BELIEVE THAT THE THIEVES WERE VERY FAMILIAR WITH THE OPERATIONS AT THE WORK SITE AND HAD SOME EXPERIENCE WITH HEAVY EQUIPMENT USE. IF YOU HAVE ANY INFORMATION REGARDING THE IDENTITY OF THE SUSPECT OR SUSPECTS INVOLVED IN THIS CONSTRUCTION THEFT BURGLARY, PLEASE CALL BRAZOS COUNTY CRIME STOPPERS. Around 1:51am, the morning of Monday, June 6th, the Bryan Food Exchange located at 2907 E SH 21 in Bryan was burglarized. The burglary was captured by the store`s surveillance camera. In the video, a burglar wearing a black tank top, black shorts, gloves and carrying either a walkie-talkie or push-to-talk style phone can be seen inside the store. Around 3:10am, the same morning, the Town and Country Food Mart located at 1401 N Texas Avenue in Bryan was burglarized. This burglary was also captured by the store`s surveillance camera. In the video, two burglars are seen creeping into the business attempting to avoid being captured by the surveillance camera. One of the burglars was wearing a black tank top and had on dark colored gloves. Bryan Police Detectives believe both burglaries were committed by the same suspect (s) based on their similar clothing and method of entry into the business. If anyone has any information regarding the identity of the suspect shown in the photo or know information about the suspect (s) involved in these burglaries, please call, text or submit a web tip. It was some time in the early morning hours of Wednesday, April 6th when a truck was stolen from a plumbing business on Clarks Lane in northeast Bryan. Evidence indicates that the suspect(s) jumped the fence, started the truck and rammed through the chain-link gate. As Bryan Police Department Detectives were working the crime scene, the Bryan Fire Department was dispatched to a truck fire in a vacant lot near the intersection of Shirley and Elaine Streets, within two miles of the crime scene. 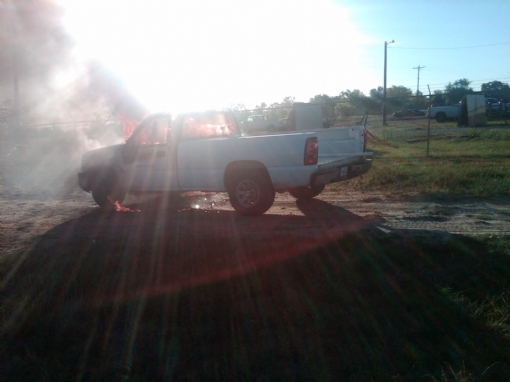 The burning truck was a 2005 white Chevrolet 1500, the same truck that had been stolen from the plumbing business on Clarks Lane. The suspect(s) had stripped the tool box and all of the tools off of the truck. The total value to the loss is over $17,000. If anyone has any information regarding the theft of the truck, the identity of the suspect(s) involved or the location of the stolen plumbing tools and equipment, please contact Brazos County Crime Stoppers. It was on Sunday, January 2nd at approximately 4:48AM when a security camera at the Blocker Building on the Texas A&M Campus recorded a suspect burglarizing the English Department Systems Server room. The unknown suspect is seen using a key to enter the room and then a short time later leaving carrying a black case. The suspect then enters the room two more times and leaves each time carrying a black case. Inside those black cases were three (3) Cannon digital cameras, two (2) Sony and one (1) Cannon camcorders and one (1) Dell Projector. The loss is estimated to over $5,000. The suspect is described as a white male, 5`10" to 6`00" tall, heavy set and was wearing a hoodie sweater and ski-mask. If you have information regarding this burglary or know the identity of the suspect involved or the location of the stolen camera equipment, we ask that you call Brazos County Crime Stoppers at 775-TIPS. The robber is described as a White male in his late 20`s to mid 30`s with a medium build. He was wearing a dark colored jacket, shirt, and pants. He had on a black ski mask and was wearing eyeglasses beneath that mask. The robber held the long barreled shotgun in his left hand. It was some time in the evening of Friday, June 11th, 2010 when over $11,000 worth of diesel fuel was stolen from a storage tank at Key Energy`s Salt Water Disposal Plant on Raymond Stotzer Parkway East of College Station in rural Brazos County. Evidence indicates that the thief used one of Key Energy`s vacuum tank trucks to drive up to the fuel storage tank, push a vacuum hose in to the tank and draw 4,586 gallons of truck diesel fuel out. The truck that the thieves used was returned to the storage yard. When compared to the truck`s mileage log, the odometer readings indicated that the thieves drove the truck less than 50 miles. Sheriff`s Investigators believe that there were more than one person involved in the theft. Also, that the thieves knew the mechanical operation of the equipment and were familiar with the layout and routine of the saltwater disposal plant. Around 1:30am on Sunday, May 9th a physical assault took place between two subjects in the vicinity of West 23rd Street, this incident would later lead to the death of 19 year old Christopher Hutchson. Witnesses describe that after Hutchson and a friend ran from the area of the assault, they were followed by two cars with between 5 and 10 persons in them. The subjects in the cars apparently caught up with Hutchson near 17th and Sims Street where witnesses advised they heard two or three gunshots then saw two boys running one direction and Hutchson running a different direction. It was just before 2 am when a home owner discovered Christopher Hutchson mortally wounded in the back yard of a residence in the 300 block of West 17th in Bryan. Bryan Police Detectives have learned that a fight between multiple people had gone on throughout the neighborhood and that Hutchson did not live near the residence where his body was found. Manuel Gusman, Joey Reyes, Johnathan Orta, Jacob Hernandez and Jose Eduardo Castillo are accused of attacking Hutchson and another man in the initial physical assault. Gusman, Reyes, and Hernandez have been arrested and charged with two counts each of engaging in organized criminal activity. Johnathan Orta has been arrested and charged with murder and two counts of engaging in organized crime. Bryan Police say the investigation is ongoing and more arrests could follow. Jose Eduardo Castillo, 22 years of age, Hispanic male is currently wanted on a 2-count felony warrant for engaging in organized crime. If you have information that could lead to the arrest of Castillo, please contact Crime Stoppers. UPDATE: JOSE CASTILLO WAS ARRESTED BY BRYAN POLICE DEPARTMENT ON MAY 10TH, 2011. On Saturday, March 20th a robbery at the Easy Shop store located at 3510 South College Avenue in Bryan was captured on the store`s video surveillance camera. The video shows the suspect as he walks into the store holding his right hand up as he walks to the front register. 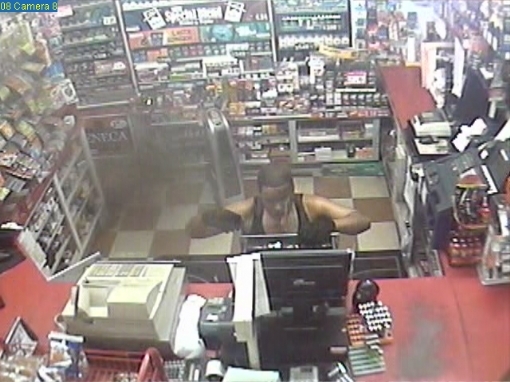 As the suspect gets up onto the counter, he clenches his right fist as if to hit the clerk. After the register is opened, the suspect then begins taking money and briefly stops to catch his balance and then finishes taking the money from the register. As the suspect begins to stand on the counter to leave, he hits his head on the overhead cigarette dispenser causing him to drop the beanie hat and the black plastic bag he had covering his face. The suspect shown in the photos above appears to be a Black male wearing a black jacket, blue shirt with a white undershirt, blue jeans, black gloves and a beanie hat with a black plastic bag. On January 19th around 8:40pm a White male wearing a rebel flag bandana as a skull cap walked into J.J.`s Liquor Store in Bryan and committed a robbery. A surveillance camera shows the robber as he walks around the counter, threatens the clerk and demands the money from the register. After the clerk opened the register, the White male is seen grabbing some of the cash and then runs out the front door. The suspect is seen getting into a dark colored SUV. The suspect shown in the video appears to be in his late 30`s, clean shaven with dirty blonde or gray hair, approximately 5`11" tall and weighing 240 pounds. He had numerous tattoos, including full sleeve on his arm and was wearing a blue short-sleeve shirt, blue jeans, and tan shoes. Bryan Police Detectives have information that the suspect rides a motorcycle and has been seen at local biker hang-outs.